Fantasies was an undeniable game-changer for Metric. Their previous three albums and dalliances with Broken Social Scene had all been slow-burn successes, but none had ignited the charts. It took them four years to deliver their fourth album, polishing their new wave-inflected indie rock to a sleek sheen, perfect for stadiums. From a numbers perspective, it paid off; Fantasies went platinum in Canada, broke the top 10 on Billboard's Canadian Albums chart, and transformed the band from indie tastemakers to radio hit makers. It makes sense, then, that Metric would be so eager to celebrate the album's ten-year anniversary that they would start ten months early, performing it in full at this year's Field Trip festival. But as frontwoman Emily Haines revealed in a mid-show monologue, success didn't come easy. The band had questioned their future while making the album, she said, and they even parted with long-time label Last Gang during the process. Any questions of Metric's longevity were long settled by the time they took the stage on Saturday. They brought the kind of arena-level spectacle of a veteran band, wasting no time in winning festivalgoers over with faithful renditions of every Fantasies track. "Help I'm Alive" started with a slower, more guitar-forward arrangement before the rhythm section ratcheted up the intensity, while "Sick Muse" sprawled through an extended outro as guitarist James Shaw rode waves of feedback into a shoegaze-y squall. Stage lighting silhouetted the group on a touching performance of "Twilight Galaxy," and the crowd's singing nearly drowned out Haines's during "Gimme Sympathy." The 90-minute headlining slot ended up working against the band, though. While the performance of Fantasies benefitted from the album's structure, the second half of the set consisted heavily of colossal stadium rock songs. It all began to feel monotonous by the time "Black Sheep" rolled around, even as "Breathing Underwater" still compelled the audience to clap and sing along to its millennial whoops. 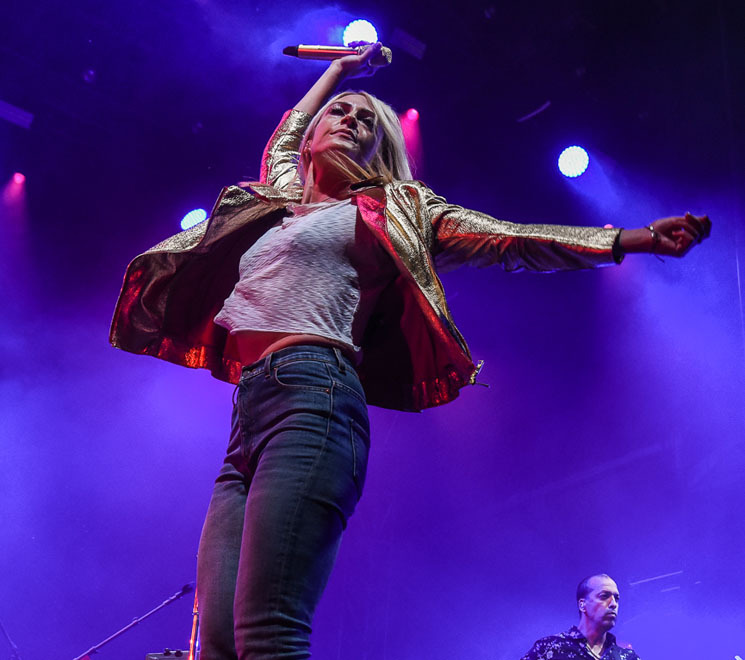 Going by the crowd's reaction, Metric still had emotion left to wring from Fantasies. If there was comparably little left for other songs, then at least festivalgoers got to travel back to 2009 for 45 minutes.